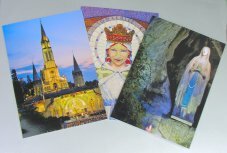 CATHOLIC GIFT SHOP LTD - 12 Top Quality Colour Lourdes Cards and Envelopes. 12 Top quality colour cards and envelopes in a gift box perfect fro Christmas, birthdays or for writing. Lourdes double Cards Measure 17 cm x 12 cm and are very good quality.